It was in September 2014 that James Fitzpatrick of Tadlow Music revealed his intention to record MiklÓs RÓzsa’s score for the film SODOM AND GOMORRAH (1962), quipping that after a lull in recording he had renewed his enthusiasm for losing money (!). On the face of it, recording S&G might have seemed a surprising decision because, since its initial release the 1962 international co-production had largely been derided or forgotten; “cheesy, trashy fun” as one of the more generous reviewers said. “It was an intriguing subject that developed into a bad picture, the kind of experience composers dread – a huge effort that sinks with the ship. But from the musicologist point of view, it was too fascinating to deny. Again, the opportunity to delve into the ancient past and possibly discover something different, something to help the composer describe the evil and perversion of the Cities of the Plain, the Helamite tribe, the love of Lot and Ildith, the sorrow of Lot as he turns away from the Pillar of Salt, and the exodus of his people from the Cities. How could I turn my back on such a challenge? As for research, I found that Idelsohn’s music of the Yemenite and Babylonian Jews provided me, as they had with my previous Biblical film scores, with themes as points of departure. These themes, along with the choruses of the Jews are all based on authentic material, going back to biblical times”. Rózsa’s remarks demonstrate how well he endeavoured to ride above the defects of the film itself. Regardless as to the quality of the film, RÓzsa was as determined as ever to provide nothing less than his best music and to be as authentic as possible to the source material. 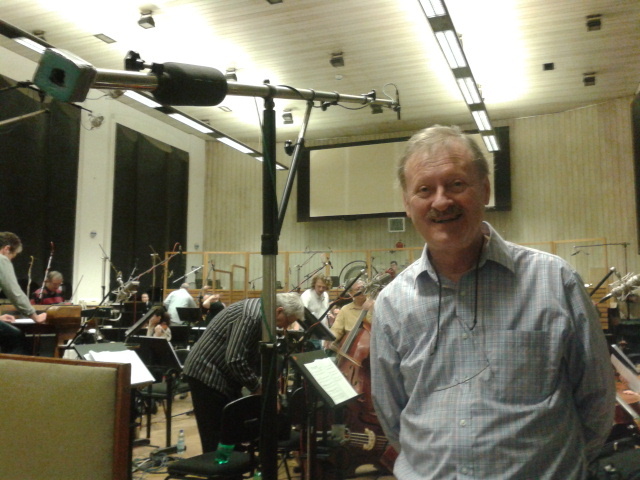 It doesn’t seem all that long ago that John Fitzpatrick, Frank K. DeWald, Alan Hamer and I had travelled to smeĉky Studios in central Prague in 2012 for the highly praised recording of QUO VADIS but this time I was the sole Society representative and so did not have the stimulating company of my friends and colleagues. Nevertheless it was good to be back in Smeĉky for what was my third outing following EL CID and QUO VADIS. For S&G seven recording sessions, of four hours each had been allotted between 13 and 16 April. I was not the only guest there because RÓzsa enthusiast Michal Turkowski had also been invited to the sessions. Michal is one of the most enthusiastic RÓzsa supporters I have ever encountered and, demonstrating true dedication, he had made a nine hour bus journey from his home in Wronki, Poland, to be present. Smeĉky had changed little since previous visits and rather than give another description of the premises and recording studio, I can do no better than refer readers to the detailed descriptions given in the articles about the QUO VADIS sessions in PMS 67. One major change to the premises was to the central outdoor courtyard of the building. From the control room and adjoining office, one looks down onto this courtyard. For many years it had been an unkempt, uncared for area but since 2012 landscape work has been carried out which has transformed the area into an attractive garden where some of the musicians would spend their leisure time during session breaks. Security had also been tightened up for access to the building. No longer could anyone walk straight into the building through the front door without requesting access. It was a pleasure to meet up again with producer James Fitzpatrick, conductor Nic Raine, recording engineer Jan Holzer and orchestrator Leigh Philips who had performed wonderful work in reconstructing the 100 minute plus score over a period of six months. I also recognised many of the City of Prague Philharmonic Orchestra players going back not just to QUO VADIS but to EL CID in 2008. Seeing and hearing the 80 piece orchestra I was struck once again at how expertly they were able to play a piece of music which they had not played or seen before. There were no rehearsals. In most cases a lengthy part of a cue would be played and then selected bars would be played and if necessary repeated for adjustments. After a first take and after studying the score, Nic would frequently give instructions to orchestra members. At other times James would request, over the speakers, for other adjustment specifics such as an instrument being played too loud or too soft. For example, after a first take of “Attack on the Hebrew Camp” James said he couldn’t hear the sleigh bells. To add to the Christmas theme (!) a jingle stick (jingle bells on a stick) was also in use. The whole process moved from one cue to another at a brisk pace. That’s not to say that everything went totally smoothly. There were times when Nic would consult longer with orchestra members and James would sometimes call a pause for editing. On commencing to play “Escaping Slaves”, proceedings came to a sudden halt because it was realised that there was something wrong with the copies of the score which meant having to leave the cue until the next day after corrections. In 1963 RÓzsa recorded a concert version of two themes from the film titled “Theme and Answer to a Dream from Sodom and Gomorrah” for an M-G-M Records compilation and this suite was also recorded during the sessions. Additionally, Leigh Phillips had made an arrangement of “Answer to a Dream” for concertmaster Lucie Svehlova to play on solo violin and her first take draw approval from the orchestra with traditional tapping of bows against instruments. The final session was given over to the source music which made a relaxing contrast after listening to some of the aggressive battle music the previous day. James obviously thought some of the playing was a bit too pleasant given the context of the source music “Very nice but a little too nice” and “It’s too elegant. It needs to be wilder. This is “Dance of the Sinners!” For one somewhat repetitive piece of music in “Welcome to Sodom” Nic said “Can we do one bar and loop it”. But I think he was joking..
During one of the sessions time was given over to playing a few Jerry Goldsmith cues (part of a forthcoming Goldsmith CD) and I was struck at how effortlessly the players went from Rózsa to Goldsmith. It made me wonder what the players thought of the music or indeed, whether it was important to them whether they liked the music or not. More likely, what is important to them is their own contribution and how they perform the music without necessarily needing to connect with the music on any emotional level. Following the orchestral sessions, there were still choir sessions outstanding, which were fixed for later in the month. Six cues have sung texts “The Desert," "Children's Games," "The Prayer," "The Quarry," "Victory March" and "Welcome to Sodom.". Frank K. DeWald had been engaged to assist on the text for the songs but in the film the song texts are not clear so this was no easy task. “Prayer” was relatively easy because it comes from the Idelsohn collection; “The Desert” melody is also from Idelsohn. However the text in some of the cues was probably not a real language so in some cases it meant Frank having to transcribe it syllable by syllable. It remains to be said that the music in the studio sounded truly spectacular and this CD, to be released on the Prometheus label later in 2015, should at last give due recognition to SODOM AND GOMORRAH as being one of RÓzsa’s finest film scores and a worthy companion to his other epic scores alongside BEN-HUR, KING OF KINGS and EL CID. Photo 2. 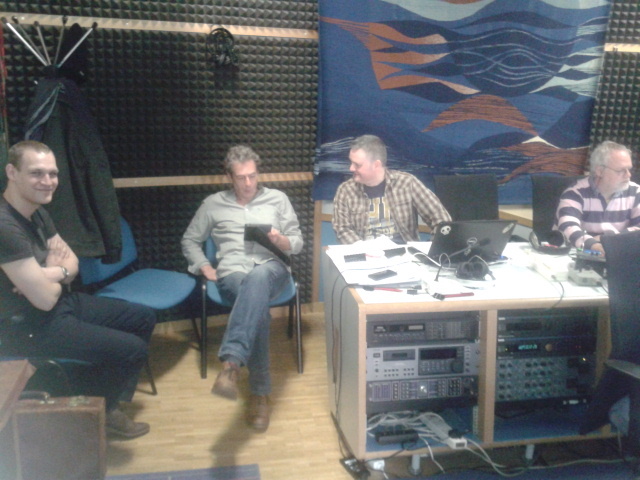 Michal Turkowski, Nic Raine, Leigh Phillips and James Fitzpatrick in the control room. Photo 3. 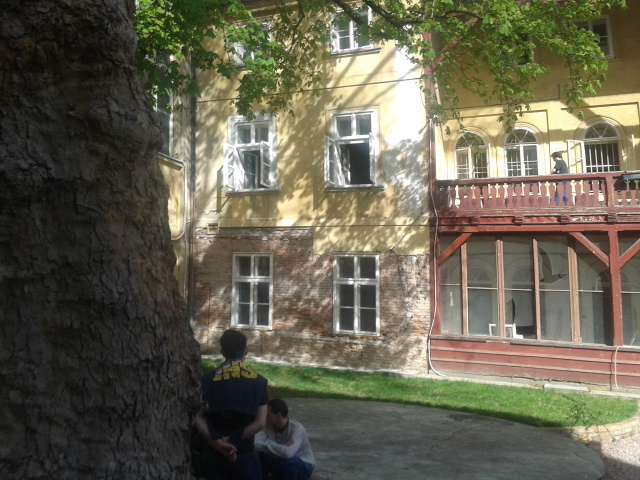 A new courtyard to relax in between takes.